Welcome to your fairy tale wedding location! It can be overwhelming looking for the perfect wedding venue: So many choices and lots to consider. Rather than us telling you why we think we’d be the perfect fairy tale venue, why don’t you see what our brides have to say? “We recently got married here and can honestly say that it was the best day of our lives! Everything was perfect and the staff (that helped make our day amazing) were first class. Claire O’Dell ensured that all our arrangements went smoothly and nothing seemed too big or too small to ask or arrange for us. She was fantastic and went through the wedding process with us and was always available if we had any queries. We went for a wedding package on the Friday which included everything that we wanted. We attended a wedding fayre and were able to see what it would look like all set up, plus arrange appointments with the flowers and chair covers services. We also met an amazing magician there, who we arranged to be at our wedding after the ceremony to entertain our guests whilst we were having our photos taken. Our guests loved this! Our only very small disappointment was that we had to take the Gilbert suite instead of the Sullivan suite as the bride and groom the following day had booked the Sullivan on the night of our wedding. The Sullivan suite was slightly bigger and had a shower and the Gilbert only had (as lovely as it was) a bath! Katy Dines (Duty Manager) was on hand during our day to take care of all the arrangements. She was brilliant and was a massive help in our day running perfectly! I lost an earring that my mum had given me that morning and the staff were so amazing in trying to help me find it. We honestly had the most spectacular wedding day and the hotel grounds are just beautiful! I can’t wait until we see our photos from the day! All our guests thought the food and the venue were amazing too! “My Husband (still seems weird saying that) and I recently got married at the Grim’s Dyke Hotel. I honestly cannot say enough good things about it. The assistance from Claire Odell throughout the arrangement process was fantastic, she was always available to answer any query, however small or daft (there were many). The day itself went so smoothly mainly due to the staff working that day but in particular Katie Dines, Duty Manager, was just amazing. She was completely unflappable and nothing was too much trouble. I was concerned that my OCD may cause a problem wanting to check everything but I needn’t have worried, it all looked fabulous and exactly as I’d imagined, without even telling her! The rest of the staff were brilliant and it wouldn’t have been the day it was without their help. We were a slightly reluctant bride and groom and were just hoping for the day to go smoothly but it was honestly the best day of our lives and I could do it all over again (without the cost of course). “We had our wedding at the Grimms Dyke in May. We really couldn’t have chosen a more ideal venue. Beautiful surroundings and everything catered for without a glitch right through from the night before through to checking out the morning after the wedding. Everything was spot on. The communication and organisation prior to the date and the delivery on the day was excellent. We opted for the the Crystal package which was ideal for us although we had plenty of flexibility to adjust it as required. All the staff were amazing and the rooms clean and comfortable. The food was great and the hotel were very happy to provide for gluten/soya/dairy free etc. All the guests complimented us on such a great choice of venue. 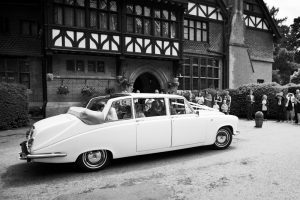 If you’re after a beautiful location for your wedding, one steeped in history and romance, Grim’s Dyke is the perfect location for you. Only 12 miles from the centre of London, we have everything you need to make your dream wedding unforgettable! The beautifully restored 19th century country house is set in 40 acres of grounds, comprising of both woodland and stunning formal gardens. 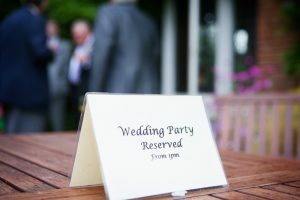 Imagine having your big day encapsulated forever, with stunning photos of you beside the pond and adjacent sunken rose garden, or next to the beautiful rhododendron bushes – both designed by Lady Gilbert. You’ll be treated like royalty whilst at the Grim’s Dyke, as staff will cater for your every need. You’ll get a dedicated wedding coordinator, as well as exclusivity – we ensure your big day is THE only big day in our diary for that date. You and your wedding party will also be served only the finest dining experience for your special day too. Our experienced chef uses only the best quality ingredients, sourced both locally and from our very own garden wherever possible. We offer a wide variety of wedding packages to suit all budgets and tastes, with a wide menu selection on offer too. So, why not make your fairy tale come true, here at the Grim’s Dyke hotel. To be kept up to date with reviews, offers, services and wedding advice please like our Weddings at The Grim’s Dyke Hotel Facebook Page.